Situated: in Perissa, 50 meter from the largest black sandy beach on the island and 100 meter from Perissa town center, a lively village that kept it's Greek character and atmosphere and offers a wide choice of shops, good quality tavernas, restaurants and bars at a reasonable price. Regular public transport to other parts of the island runs till late at night. There is a diving club and horse-riding club 100m from the hotel. New: Complete renevation in 2003. Consist: tastefully furnished modern studios from 2-4 pers. And rooms from 2-6 pers, built in the traditional island style. Hotel Facilities: Seawater swimming pool, children's pool, Jacuzzi, pool snack and coffee bar, TV-video and breakfast lounge with breakfast buffet, private parking. Daily cleaning service. Rooms facilities: All rooms and Studios with Air-conditioning/heating, refrigerator, satellite Tv and in-house movies, safe boxes, hair dryer, kettle for coffee, direct dial phone, private bathroom, balcony, new ecological and anatomic matresses. 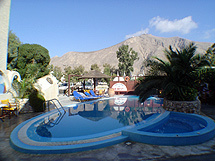 Other Services: jacuzzi, childrens pool, snack bar. Reception facilities: Multilingual reception with fax, telephone, Internet, travel service and car rental, barbecue party. We accept visa card. Daily maid service, Sun beds and Umbrellas.